1. 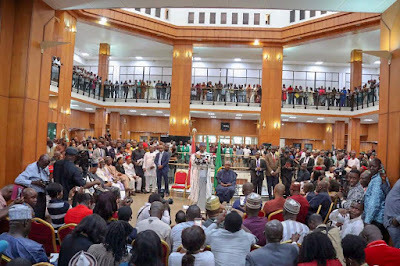 It is a matter of record that yesterday, lawmakers and staff of the National Assembly were prevented from entering the National Assembly Complex by heavily armed security agents of the Department of State Services (DSS). All entries to the Complex were blocked. The National Assembly, the seat of democracy in Nigeria, was under lockdown. Senators and Members of the House of Representatives were prevented from gaining access. 2. The ensuring standoff was a show of shame that played itself out over several hours in full view of the country. In no circumstances should this have happened. And we as a nation reaped the bitter fruits instantaneously, as evident in media images relayed around the world, images that shame us as a democratic nation. The siege was also an act of cowardice by those seeking to carry out an illegal impeachment of the leadership of the Senate in flagrant disregard of the law. People who seek control at all costs, by whatever means, never minding the injury to democratic norms. 3. 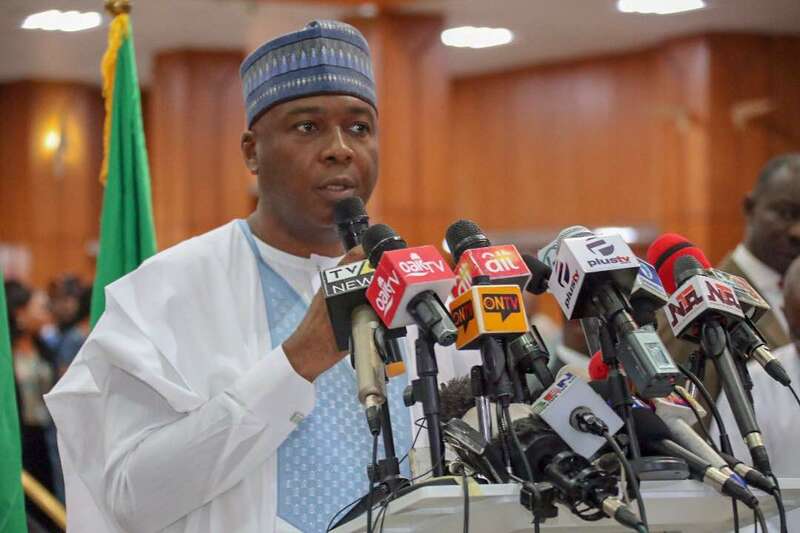 I have to say that this is not about me – Abubakar Bukola Saraki as an individual. It is not about Ike Ekweremadu, nor is it about Yakubu Dogara. I am speaking for my colleagues when I say that this is about the soul of Nigeria, what we represent as a country, and our standing in the comity of nations. This is a country where so much is expected of us, so many rungs of the ladder that we are supposed to have ascended as a nation. Instead we are wallowing in impunity and illegal show of force, all of which retard our progress. 4. This is most disheartening. I don't get any joy in saying: I said so. I don't. However, some of you may recall that about two years ago, I stated that there was a government within this government, to a purpose that was not in the interest of what the people voted for. I said it then, and now we are beginning to see the manifestations of that government within a government. It beats one's imagination how the head of an agency could have authorized the brazen assault on the legislature that we saw yesterday. Despite the threat to our lives, we shall continue to fight impunity and injustice in this country. 5. Happily, by the actions that Nigerians took yesterday, they demonstrated our strong resolve as a nation not to give ground to oppression. The legislature, more than any other institution in this country, more than any other arm of government, represents the will of the people. We are elected by the people, and an assault on the legislature is an assault on the people of Nigeria. The forcible shutdown of the legislature was an unconscionable assault on a national institution, and thanks to all your efforts, the aggressors have been put to shame. 6. 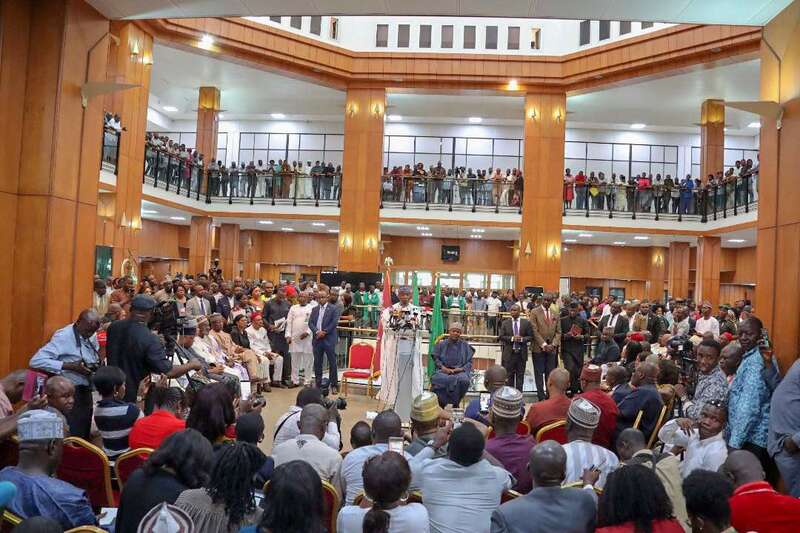 The resistance mounted by staff of the National Assembly, my colleagues in both chambers and Civil Society Organisations (CSOs) who refused to leave the entrance of this Complex until the siege was broken, strengthens my faith in the people of this country. The rain fell, the sun rose, but Nigerians stood their ground in defence of democracy. With the strength of will demonstrated by everyone against unwarranted and unconstitutional militaristic might, the siege could not stand. 7. By this, we have shown that Nigerians can resist government within government in whatever guise, and this is humbling for me. Those who sought to attack the National Assembly under my leadership for their selfish ends have only affirmed my belief in this country. They attempted to execute an illegal impeachment of the leadership of the Senate without the backing of the law, but they faltered. I am confident that, together, we shall always defeat acts of unconstitutionality. The rule of law shall always prevail. 8. I want to thank Nigerians, Senators, Members of the House of Representatives and National Assembly Staff, for standing up to be counted for democracy during yesterday's siege. 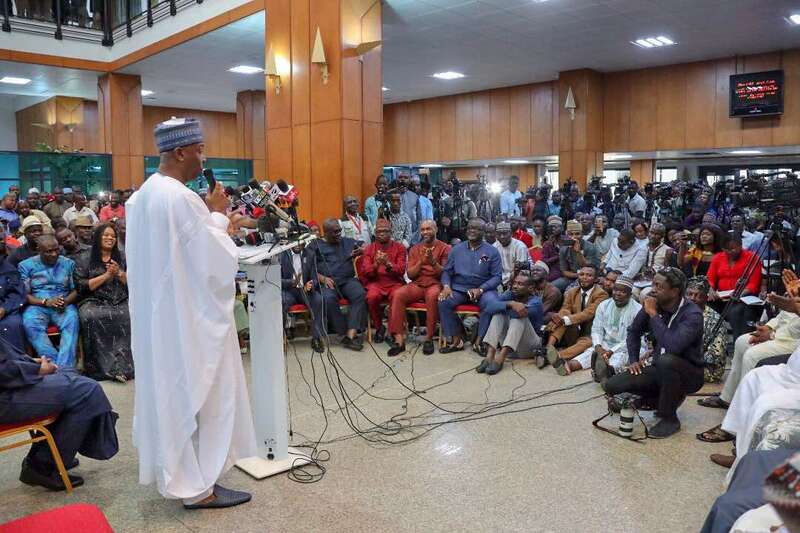 I thank the thousands who monitored the situation on radio, television and social media, voicing their outrage at the siege, thereby sending a clear message to those that hatched the plot that the Nigerian public would not buy this act of gangsterism using instruments of state such as the DSS. 9. I also thank the international community – particularly the European Union – and the international press, for their prompt reactions to the invasion of the National Assembly. CSOs and Socio-cultural groups were emphatic in their statements during the crisis, and we very much appreciate their vigilance. 10. Among the many that come up for special mention, I believe that Honourable Boma Goodhead, a member of the House of Representatives, stands out. She looked a masked security operative in the eye and dared him to shoot. She let it be known that Nigerians would not stand for the barricade at the National Assembly, that we would not be cowed. It was another pointer to what is possible in this country when women take their place in leadership. 11. I applaud all who kicked against the atrocity and who stood firm until sanity prevailed. I am proud of how everyone conducted themselves in what was no doubt a tense standoff. The principled stance and defiant reactions to the ugly incident, proved crucial to the failure of the plot. This is what we have been saying about the power of the people. The role of the people in defending democracy is paramount. 12. I thank the Acting President, Prof. Yemi Osinbajo, for his handling of the situation we were all confronted with yesterday. His decisive action went a long way towards restoring confidence. It sent a powerful message – that the DSS cannot be recklessly deployed against institutions of our democracy. The path of leadership is not by party, and we must commend it wherever it is found. Mr. Acting President did the right thing. However, the damage control so far does not address the question of how this atrocity happened in the first place. 13. This is an incident concerning which we have it on good authority that it has been in the planning for months, and yet it was allowed to happen. How is it that such an atrocity was not prevented? How is it that the masterminds were not deterred? Very serious questions remain that can only be answered by a full investigation. We call for an investigation, and we demand that all perpetrators are brought to book. We owe it to ourselves to ensure that such a situation never occurs again. Many agencies have abused their powers and acted outside the ambit of the law on occasion. Where abuses occur, similar actions must be taken immediately and full investigation instituted. 14. I must say that when we fought for Change, we could not have envisaged a scenario such as unfolded yesterday – an atmosphere where people cannot tolerate dissent, or mere differences of opinion as to the future of our dear country. This is not the Change we fought for. We did not fight for instruments of state to be used to oppress Nigerians and their lawmakers. I know that I, certainly, did not fight just so the legislature could be undermined and subjected to this onslaught. 15. There are many lessons to be drawn from the ugly incident we all witnessed yesterday. For one, government must ensure that security agencies remain neutral and act in line with the position of the constitution as well as their enabling laws. Heads of Agencies should be accountable, and those who step out of line must be held responsible for their actions. Enough with impunity. Enough with the reckless and senseless deployment of militaristic force. Enough. 16. In this dark cloud, we can see the silver lining, and that silver lining is the commitment of Nigerians to defending their hard-won democracy. I am more than encouraged by the strength, the determination and the resolve of ordinary Nigerians to see to it that democracy survives and thrives in this country. I am also strengthened by the determination of the media to report and analyse the truth as they see it. 17. I want to reassure Nigerians that, on our part, we remain committed to working for a country governed by the rule of law. Our desire is to have a society where there will be equity and justice, not oppression. We stand committed to doing our utmost as lawmakers to ensure that the responsibility and functionality of governance are met. Although we are on annual break, we are daily reviewing the situation and are alive to the responsibility to take action as necessary. Unfortunately, yesterday's shutdown prevented us from meeting with INEC, as scheduled, to address funding concerns. We will continue to look into the matter. In the spirit of that, we also appeal to Mr. President to sign the 2018 Electoral Act Amendment Bill which has been sent for his assent. 18. I remain confident in the support of my colleagues and their focus on the job at hand, which is to serve the Nigerian people. My confidence is unshaken. I remain committed to the success of the historic 8th National Assembly, and to the continued progress of our country. NBA elections: What Is Your Interest? Get PUrified | S. Oyawole, Esq.